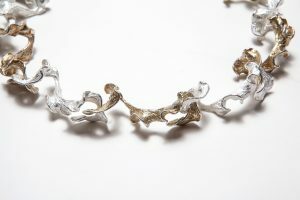 Established in jewellery for over twenty years, Donna Collinson has been creating several instantly recognisable collections of contemporary sculptural jewellery utilising the ancient lost wax casting technique. She works in solid silver, bronze and gold and takes inspiration from our British beaches and landscape. Donna grew up in Devon where she spent happy times beach combing the river Dart for natural and historical finds. Age 13 she was tumble polishing pebbles and selling early work in a Kingswear craft shop. After A levels she spent time travelling in Europe, immersing herself in the cultures she encountered, and pivotaly working for a top contemporary designer in Crete. Having learnt many new skills at the bench Donna returned to Plymouth she studied OND Design Crafts Jewellery under Peter Lamb of Gerrards jewellers. Her work was influenced by sculptors Barbara Hepworth, Henry Moore and Peter Randal Page. Further travels in Australia, Southeast Asia, China and Russia, researching endemic jewellery styles and cultural diversification informed her honours degree. jewellery and set up her studio in Guildford. 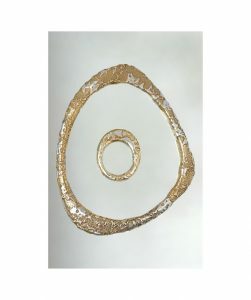 The purity of form, clean lines and strength of materials, combined with details of gold, semi-precious and precious stones and oxidisation provide the work with an identity that is primitive, organic and temptingly tactile. Etched, reticulated, and satin finishes interpret the sea tumbled qualities of pebbles, shells and fossils. Recently Donna has incorporated pieces of drilled sea glass in her work found by Kayaking to otherwise hidden inaccessible beaches. Rings and bangles are ergonomically designed to fit to the body’s bone structure considering comfort as central to good design. The work is interactive – created to be played with when worn. Donna’s jewellery has been sold at select galleries and fairs such as Bonham’s, The Royal Festival Hall, Fenwick’s of Bond Street, The Affordable Art Fair and Craft in Focus Fairs. Her work has featured in The Times, Evening Standard, Cosmopolitan, Crafts, Craft and Design magazines, in books and on television including Peak Practice. 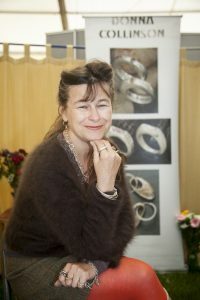 The jewellery is held in private collections throughout the UK, Europe, USA, Japan, Australia and New Zealand.Enjoying to meet customers and collectors in person Donna shows her work at quality Craft Fairs mostly in the south of England.